39 years ago today, Gough Whitlam made history by giving land back to Vincent Lingiari and the Gurindji people -- an iconic symbol of reconciliation and the achievements of the land rights movement. This is a great day for Australia to celebrate. 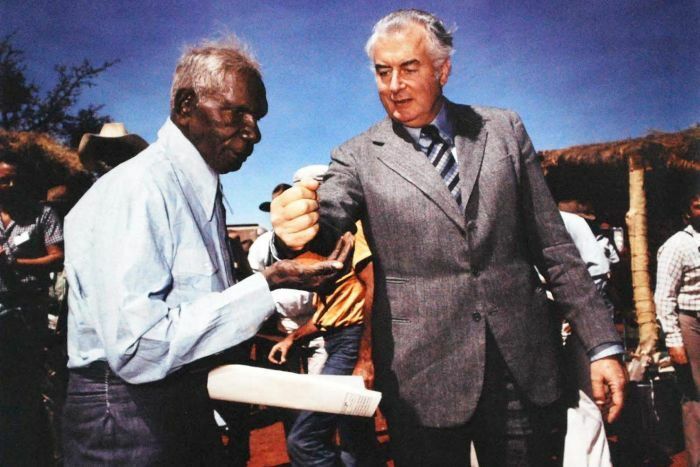 I think this day and this image of Whitlam and Lingiari is as important as any national day Australians celebrates (despite the picture's overtones symbolising the white commander and the black controlled). There are not many of these types of cultural artefacts which are outwardly promoted and celebrated as a nation. I believe this day is more important to the Australian cultural fabric than the external war campaigns Australia celebrates (why has the military machine taken over our cultural celebrations? $$ reason to buy more and more war hardware and to increase Australian Federal budget percentage). Australia readily celebrates the colonial past and empire heritage). Why can't this cultural activity gain higher status than Gallipoli? Unfortunately, whilst land rights was a significant phase of cultural action Australian Indigenous people continue to suffer the conditions of poverty, systemic racism, low education standards and early death. There are other powerful systemic injustices occurring. It is remarkable that since 1975 neither Liberals or Labour has provisioned any form of justice against those who implemented systemic human rights violations against our indigenous people. It continues to support individuals and companies who have made profit from Australian Aboriginals (our land custodians). As a nation, we can't even identify Australia's 1st war engagement (colonialists vs Aboriginal) within the Australian War Museum. Both Liberal and Labour polices need to move from under the umbrella of intervention. Prime Minister Whitlam was the first to do so, followed by Keating and Rudd. These cultural achievements need to be celebrated if we are to become an inclusive nation, but much much more is needed. Let's as a nation celebrate inclusive philosophies, knowledge, cultural activities and spiritualities rather than the atrocities that are bedded to exclusion. Australian cultural celebrations by jjfbbennett is licensed under a Creative Commons Attribution 4.0 International License.